From opposite ends of the country comes new music written for and premiered here by the renowned ensemble Collage New Music. Californian Imbrie's Pilgrimage calls for flute, clarinet, piano, percussion, violin, and cello. New Englander John Stewart McLennan's Essay employs the classic instrumentation of piano and string quartet. These two outstanding creative statements are united by the committed performances of Collage. 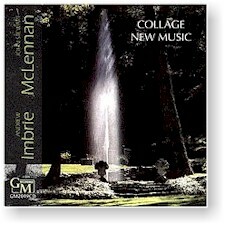 "Imbrie presents us with a shining, meticulously-crafted sound mobile; McLennan's piece is a forthright piano quintet, so idiomatic that it seems to smell of resin and paste wax." Recorded on (#1-2) 11 May 1987 and (#3) 24 February 1987 at First and Second Church in Boston, Massachusetts.